If I had to write a caption for the above picture, without knowing anything about the game situation during which it was taken, I’d probably still go with… “Uhh… You guys are dicks.” That confused young man in the photo is Kansas City Royals relief pitcher, and New Jersey native, Vin Mazzaro. Vinny from Jersey had the distinct honor of taking one for the team last night in a game which the Royals lost 19-1 to the Cleveland Indians. Vin didn’t start the game last night, Kyle Davies did. Davies walked the bases loaded before being removed due to some shoulder soreness. After another reliever pitched an inning and a third, Mazzaro was asked to save the rest of the bullpen by giving the Royals some innings. 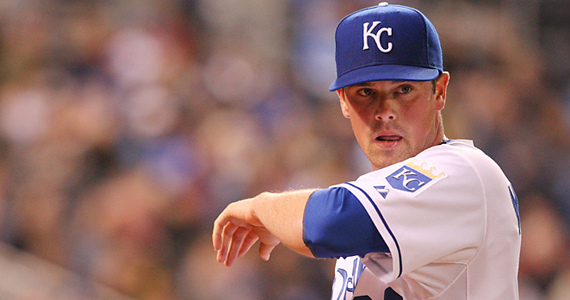 Mazzaro was only able to give the Royals two and one third innings, but he gave the Cleveland Indians a whole lot more. Cleveland tagged Vin for 14 runs on 11 hits (3 walks) in those two-plus innings, making Mazzaro’s outing the worst relief outing since Lester McCrabb gave up 14 relief runs in 1942 for the then Philadelphia A’s (cnnsi.com). He allowed 10 runs in the 4th and 4 in the 5th before finally being pulled. His ERA for the season is now 22.74. So what happens to a player when he goes out there and basically ruins his statistics for the season and becomes one of the blooper stories of the season? Does he get a reward? A Parade? A “thanks, kid.”? If you’re Vin Mazzaro, you get sent down to AAA the next day. Hey Royals, you guys are dicks. Just for fun, here’s the video from MLB.com.